Up Your Style Game This Fall, But Buy Now! So to To up your style game this fall, may I suggest a few things you can buy now? I’ve listed out a few high-end and mid-range designs for each category, some of them might already be on sale. Bookmark this post and check back during sale season for even better deals! Anything with ostrich feather will immediately make your look current. My favorite silhouette is relaxed, minimal style tops or skirt with a sizable feather trim. Bags with feather trim are are less expensive and easier to style with. 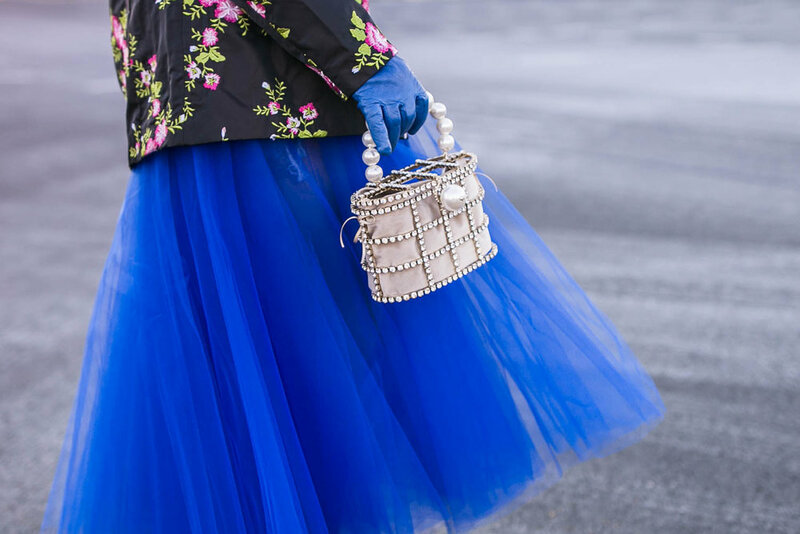 Tulle skirt is not new to the market at all, but this season go for a vibrant color, and / or add a masculine touch with a blazer or layered over denim / biker shorts. Those details will instantly update your look. My personal goal is to score a Dior one on sale, but these are many more “affordable” styles on the market now. Beaded bags are EVERYWHERE but I am not referring to those. A fun design with lots of pearls or crystal embellishments, is no longer evening-only. Pair with a simple casual look of shirt and jeans, or dress up with a maxi dress or skirt, these bags will make your look sparkl! If you are not into metallic or embellished footwear, these bags will be the perfect alternatives to sport some bling without overdone it. Must have leather blazer, repeat that three times! For 2019, on top of my wish list is an oversized leather blazer / coat. Pastel colors are trending but if I ought to invest in one, I will go with a black or tan so I can style it with for looks and for years. Bodysuit is not news, romper is the new go-to shape. Paired with a tulle skirt and kitten heel, you are more than current with the trends! Go for a good quality one because texture and quality is what make a look more expensive. Beyond 2019, these 5 things will still be relevant, they will continue to add that little special touch to your outfits. When you decide to buy that more expensive designer option, your purchase will continue to give instead of collecting dust in the storage.